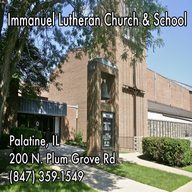 Immanuel Lutheran Church & School is a vibrant, growing and active church, located in Palatine, IL. We offer four different and exciting service styles, every weekend: Sat Blended (Sat 5 PM), Traditional (Sun 8AM), Blended (Sun 9:15 AM) and Contemporary Praise (10:45 AM). We hope and pray that you will be blessed, either on-line, through our website (immanuelpalatine.org) or even better, in person at 200 N. Plum Grove Road, Palatine, IL.